Who is Mari Kondo and what is all this fuss about? Already KonMari-ed your whole house? These words mean nothing to you - but - you want to explore the "theology of stuff" with other Anglicans who are eager to reflect on our stuff, what it means to in our own lives, our common life, and how we can foster the great Joy of Easter in our daily lives? Then this is the Lenten Series you've been waiting for! 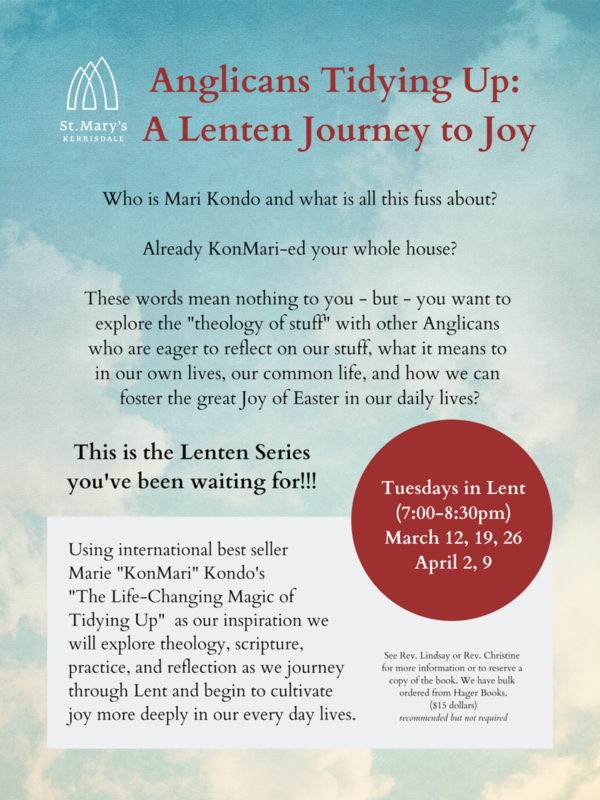 Using international best seller Marie "KonMari" Kondo's "The Life-Changing Magic of Tidying Up" as our inspiration we will explore theology, scripture, practice, and reflection as we journey through Lent and begin to cultivate joy more deeply in our every day lives.